A look inside Plain Goods. All photos by Michael DePerno and Andrew Fry. When designers Michael DePerno and Andrew Fry left NYC and Northern California to open their chic lifestyle shop Plain Goods in New Preston, Connecticut, they knew what they were doing. 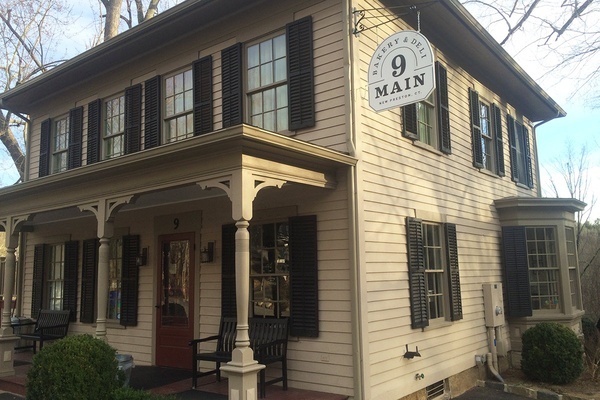 The quaint New England town is a dream for designers and shoppers. Bring a van if you drive out to this small town in northwestern Connecticut. You might end up redecorating after hitting their favorite spots. NEW PRESTON, Connecticut – The northwest corner of Connecticut is known for its rich history and natural beauty — rolling hills, rivers and lakes, and some of the best preserved homes and structures in the country. When friends visit from far and wide, they are often impressed by the gentle, relaxed nature of the region, which is one of many reasons we choose to call it home. Along with its proximity to New York City, we were drawn to the area because we wanted to live in an antique home, which was a great contrast to Michael's former mid-century modern home in Northern California. When we decided to open our shop , we found a sweet old cottage in the village of New Preston in need of some TLC. It sits on East Aspetuck River and New Preston Falls and couldn't be a lovelier setting. We opened this past November just around the corner from Main Street, a bit off the beaten path — just how we like it. The many inspiring shops, gardens, and architecture — all of which weigh heavily in our work — make New Preston a designer's — and a shopper's! — dream. These are our favorite spots. 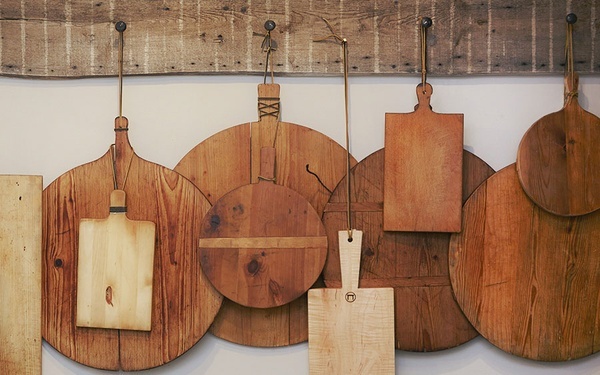 Vintage cutting boards at Privet House. Photo courtesy of Privet House. 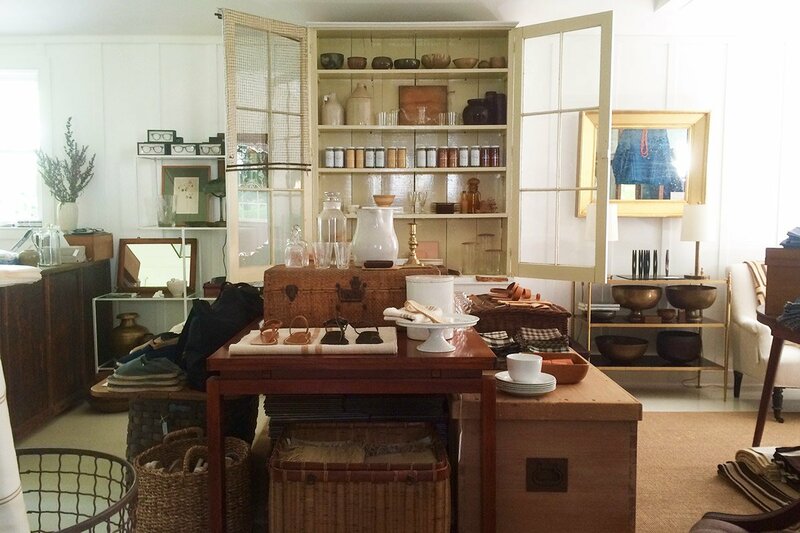 A thoughtfully curated shop with interesting Japanese furnishings. Owners David Whitman and Peter Stiglin are the masters at bringing the indoors and outdoors together. We recently purchased a beautiful, vintage Japanese plaid pillow for one of our design projects. Of course this is one of our favorites! 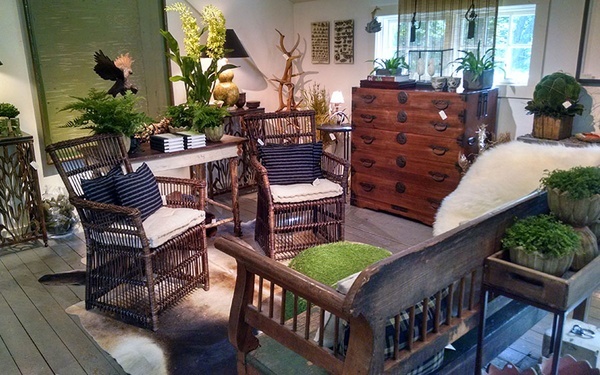 We carry a mix of clothing, textiles, pantry items, shoes, leather goods, apothecary items, antiques, and vintage pieces with a natural, unadorned refinement. Situated in a wonderful antique two-story building, Suzanne Cassano and Richard Lambertson have created a true shopping experience. Their expertly curated collection of all things home and beauty is so appealing. We love their Santa Maria Novella products and always find something new at their revolving pop-up shop next door. The indoors and the outdoors in harmony at Pergola. Hand-printed papers at DK Schulman. One of the best collections of period Swedish painted furniture we've seen. The upper level of shops range from antique carpets to vintage rattan furniture. A go-to for anything kitchen. We love their hand-dipped candles in a rainbow of colors and owner Marty Rook's thoughtfully selected cookbooks. 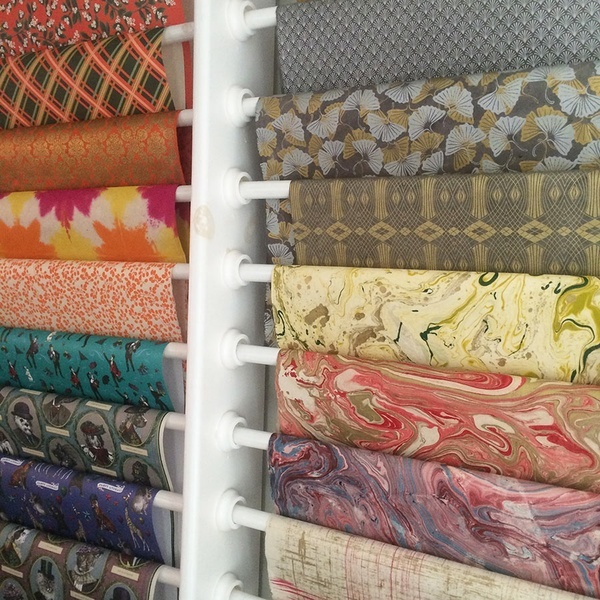 The upstairs of this shop has a wall of wonderfully colored bulk stationery, bolts of ribbons, and exquisite handmade papers. An intimate space where Sal gives great haircuts and carries the full line of Aveda products. A shop chock-full of clothing and home furnishings. The pioneers of New Preston Village, the Seitz's have a little something for everyone. We are especially fond of their Hartford cotton shirts. The colorful offerings at Sweeets. A sweet little market in a barn-like structure with a great selection of local lettuces, fresh picked vegetables, and cheeses. The chicken pot pie is especially tasty, and comes in two sizes. The incredible whole-wheat scones are reason enough to come, but so are the Waramaug sandwich and the out-of-this-world blueberry waffles they make from scratch on weekends. 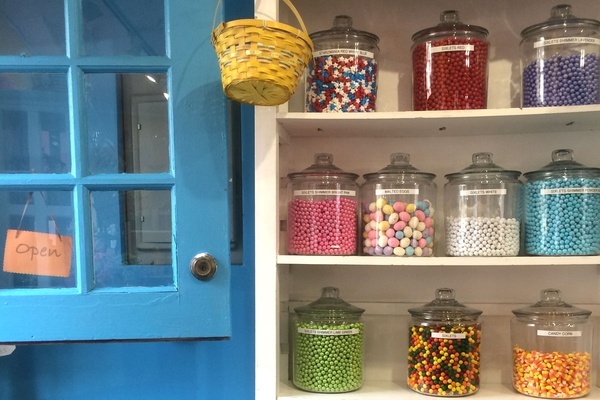 Jars and jars of candies abound, old-school treats like Necco Wafers and the best malted milk eggs, personal favorites. A wonderful place for shepherd's pie and a beer with outdoor seating on the Aspetuck River. 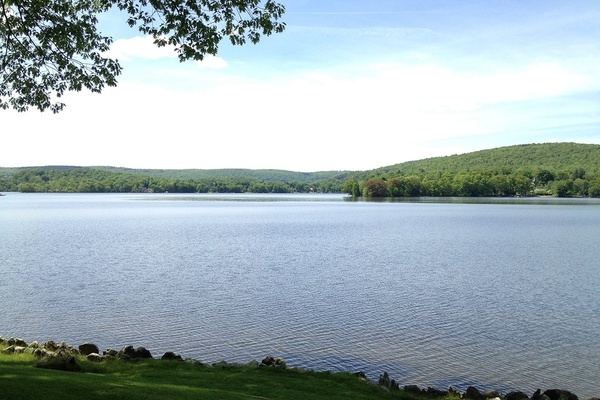 An afternoon scene on Lake Waramaug. 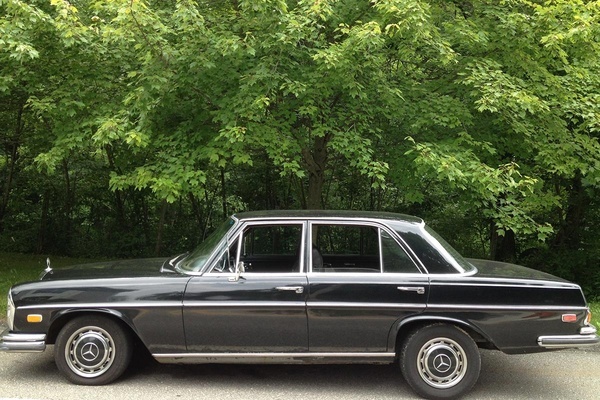 The sweetest ride around: A vintage car for an antique town. Named after Chief Waramaug of the Potatuck Native American Tribe, the lake is one of the crowning glories of the area. Biking by the pristine waters is great exercise and we like taking out our canoe and kayaks. It's one the the best places in the summer for swimming and recreation. And when you're here, spend a few hours in Washington, our charming hometown nearby. New Preston is about two hours from New York City. The easiest way to get here is by car, though there are Metro North trains that stop at the Harlem Valley Wingdale station. From there, it's a 35-minute drive into town. and Andrew are the co-owners of , a lifestyle shop in New Preston, Connecticut. You can follow them on Instagram at . They travel for the education, inspiration, and new experiences.